1 Preheat oven to 200°C/180°C fan. 2 Place kale in a large bowl with oil and salt; using hands, massage leaves to coat well in oil and to soften. Arrange kale, in a single layer, on an oven tray. Roast for 20 minutes or until crisp. 3 Meanwhile, cook the sweetcorn on a heated oiled grill plate (or grill or barbecue), over medium-high heat, for 10 minutes or until lightly charred. Using a sharp knife, remove sweetcorn kernels from cob. 4 Using a spoon, scoop out pieces of avocado flesh. 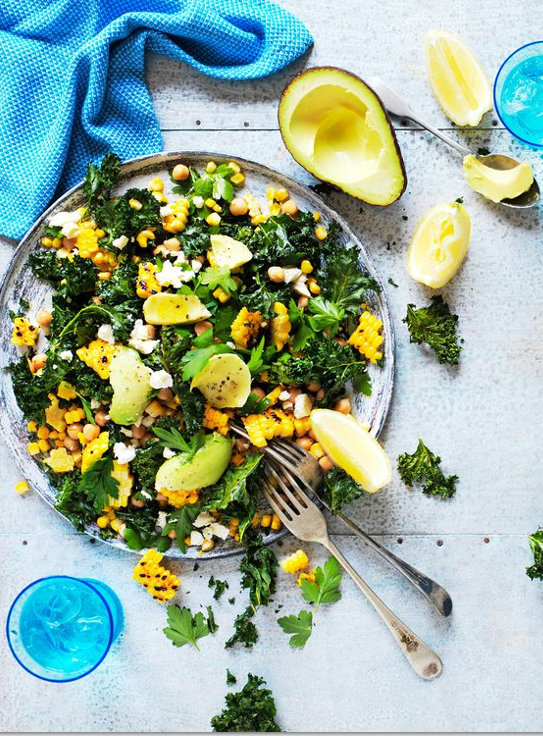 Combine kale, sweetcorn, chickpeas, avocado and parsley in a large bowl. Pour combined extra oil, juice and garlic over salad; toss gently to combine. Top salad with feta. Serve with lemon wedges.